I thought I’d add my thoughts on the subject here, in particular about the relationship between collectors, museums and ethics. One of the most common criticisms that comes from the scientific community is that these high profile and expensive auctions, way above the budgets that museums can afford, result in a loss to science when specimens pass into private collections. I don’t want to downplay that this is a real problem, I know of at least two examples of important material that would likely cause a re-evaluation of entire groups of organisms but which are resolutely in the hands of private collectors who won’t allow them to be accessed. However, other museums, particularly art collections, embrace and work with private collectors. The museums get to display important or interesting objects and the collectors receive credit and validation for the collections they have built up. Furthermore, the buying, selling and trading of artworks means that there’s an excellent paper trail in the form of auction and exhibition catalogues which means that the movement of works can be traced much more readily than natural history specimens which don’t have this tradition of a published, publicly accessible paper trail. When it comes to natural history I think we’re too quick to demonise private collectors with the “loss to science” rhetoric. Many of today’s largest museums were founded as private collections that were donated to the nation including the Natural History Museum London, the Natural History Museum Tring and the British Museum. Of course the Tate galleries still bear the name of the man whose funds and collections seeded what is now considered one of the most important art collections in the world. Recently two George Stubbs paintings, the first Western depictions of Australian animals were ‘saved for the nation‘ by the National Maritime Museum (NMM). The works were finally secured by a significant donation from a shipping magnate and patron of the NMM. It would be interesting to consider if the paintings would have been saved in the same way if it were the Natural History Museum trying to secure the funds instead. Natural history museums don’t receive anywhere near the same level or have such a long history of patronage supporting them as other kinds of museums. Often it’s assumed that buyers of multimillion pound specimens erect them in their mansions and display them as ‘trophy’ objects. That’s not to say that this doesn’t occur but I think it’s fair to assume that these buyers may have a keen interest and love of natural history. Perhaps talking to private collectors instead of instantly labelling them as a problem would improve the patronage and support of natural history museums and increase the awareness of ethical collecting and trading. These are the kinds of dinosaurs (and other prehistoric organisms) most museums can afford. These are in fact part of the Grant Museum collection. If relationships were improved there’s also the danger that scientific research on specimens could be used to increase the price tag of specimens as commercial assets. 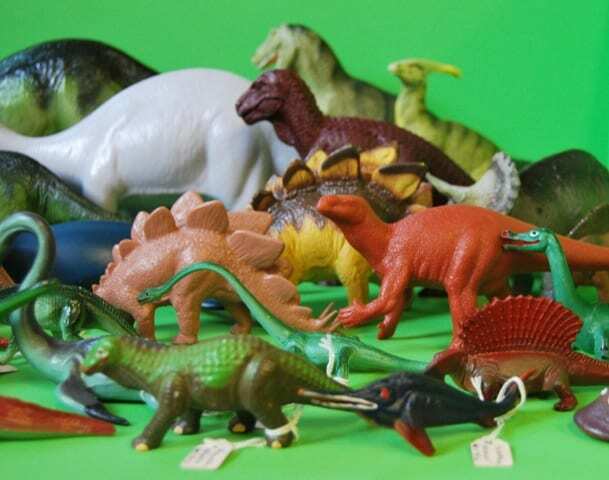 Say for example, if research on the recently sold Diplodocus skeleton revealed that it was the largest, rarest or the only example of a new species this increases the rarity and desirability of the object and pushes the price even further away from the reaches of public institutions. Conversely, research may devalue a specimen, yet another reason why private collectors may be wary of caliper bearing scientists examining their collections. It’s already ubiquitous across museums to never give a valuation on objects brought in for opinions or identifications to avoid certifying or authenticating material for sale. I’d recommend looking across the museum sector to seek guidance on how other museums deal with the issues of research affecting commodity prices. Lastly, working with private and amateur collectors can very realistically improve our knowledge about the natural world. Anecdotally, I’d say that there’s a deep mistrust of museums by amateur collectors (either those buying their collections or those collecting fossils and unfortunately extant animals from the wild). There’s the perception that once an object goes into a museum collection it’s essentially lost to the public, only accessible to card carrying scientists. With museums bursting at the seams with objects, only a tiny proportion of collections on display and visits to collections requiring managing it’s easy to see where this perception comes from. Again, looking to other museums provides guidance. The excellent, excellent Portable Antiquities Scheme is a solution to this exact problem in archaeology. There are thousands of amateur archaeologists, metal detectorists and collectors and the portable antiquities scheme is an easy way to encourage the wider archaeological community to register finds. They are given full credit for the discoveries, there’s a prestige associated with contributing to the scheme and their finds and data are almost instantly available to the wider sector. Quite why a similar scheme for fossil finds doesn’t exist is increasingly perplexing especially as the legislation and policing of the movement of fossil material, as the aforementioned Tarbosaurus auction highlighted, is nowhere near as robust as it is with artworks and archaeological material. With museums brokering discussions with private collectors and auction houses we could better support patronage for museums, save important specimens for the public and improve our understanding of palaeontology and biology. People who pay for things are likely to have both the interest and resources to look after them. That can’t be said of every museum! Moreover, stuff obtained by private collectors is not necessarily “lost” to science or posterity. My own private collection forms the basis for many published papers and 9 books. Moreover, it includes quite a lot of things discarded by museums in the past as lacking value or interest. Arguably I have actually rescued things for science and prevented their loss. A brilliant new book by John Whiteknight (“Under Glass- a Victorian obsession”, Schiffer, Atglen, PA ISBN 978-0-7643-4407-7) is a scholarly review of taxidermy, wax flowers and other esoterica under glass domes. It’s based on his own wonderful private collection of (mostly British) artefacts that he bought and keeps in America. His collection may be “lost” to Britain, but is the stuff that museums threw out and antique dealers used to despise. Like me, he has performed at his own expense a valuable curatorial and scholarly service. Nothing is lost by collaborating with interested private collectors. We share similar objectives to formal institutions, but often have more time and resources to devote to them, especially now when institutional staff are under such pressure or even unavailable. I’ve seen a real lack of ambition to develop care for and make more of existing natural history collections in some museums. Causes may be the individual preferences of curators who are not big fans of the subject or due to the inherit bias against anything that isn’t ‘art’ created by the current name and policy of the Arts Council. In general I feel the decrease in specialists in natural science is the main symptom of this. Why should museums be the only place you can house a type specimen? I feel developing better relationships with collectors is the key. A PAS scheme for fossils would be a great starting point. Hi Phil, thanks for your comment. I agree with what you say about creativity and ambition and the evidence from the recent Natsca/ACE survey into the popularity of natural history galleries in mixed museums shows there’s a real opportunity to engage visitors as NH galleries are the most popular with visitors (even if they are somewhat neglected in many museums). I think we have to be very careful when bemoaning the lack of specialist knowledge in natural history museums. After all it’s a history of ‘subject specialist’ curators who were all but ‘curators’ int he modern sense that has left many natural history museums in a dire state in terms of documentation. I think we do need specialists but they need to be museum natural historian specialists with a natural history background but also the full gamut of museum specialized skills including; political skills, communication, interpretation, creativity, social media, management etc. I think its six of one, half a dozen of another when it comes to the decrease in NH curators, yes there’s a bias towards some disciplines depending on the higher ups but also NH curators haven’t been as good as demonstrating the importance of their work and collections outside of a niche community and importantly to museum managers (broadest of brushstrokes here).